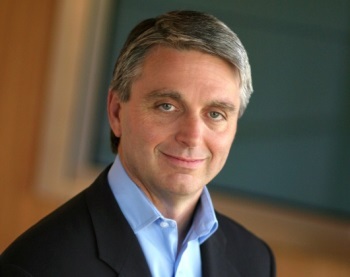 John Riccitiello has announced that he will step down as chief executive of Electronic Arts at the end of the month. Acknowledging that the company's financial performance is tracking below expectations, John Riccitiello, who has served as CEO of Electronic Arts since 2007, submitted his letter of resignation to the board of directors today. His final day will be March 30. Riccitiello will be temporarily succeeded by Larry Probst, who was named Executive Chairman by the board. "We thank John for his contributions to EA since he was appointed CEO in 2007, especially the passion, dedication and energy he brought to the company every single day," Probst said in a statement. "John has worked hard to lead the company through challenging transitions in our industry, and was instrumental in driving our very significant growth in digital revenues. We appreciate John's leadership and the many important strategic initiatives he has driven for the company. We have mutually agreed that this is the right time for a leadership transition." "EA is an outstanding company with creative and talented employees, and it has been an honor to serve as the Company's CEO. I am proud of what we have accomplished together, and after six years I feel it is the right time for me pass the baton and let new leadership take the Company into its next phase of innovation and growth," the soon-to-be-former CEO added. "I remain very optimistic about EA's future - there is a world class team driving the Company's transition to the next generation of game consoles." Riccitiello actually assumed the CEO mantle from Probst while the company was still trading at around the $60 mark; the subsequent half-decade has seen the company's share value plunge to well under $20. Whether that crash in value, and EA's inability to return to its previous state, had anything to do with Riccitiello's decision to fall on his sword is the sort of question that nobody in a position to know will ever answer, but is nonetheless almost certain. UPDATE: In his resignation letter, Riccitiello stated that his decision to leave was driven by "accountability for the shortcomings in our financial results this year." "It currently looks like we will come in at the low end of, or slightly below, the financial guidance we issued to the Street, and we have fallen short of the internal operating plan we set one year ago," he wrote. "And for that, I am 100 percent accountable." Riccitiello's resignation letter can be read in full at the EA Blog.